Are you ready for fall, and what’s up with this weather? If you’re like me than you’re ready for a break from this heat and ready for a change! Even though the weather doesn’t look like it is going to break in the next week or so in the Harrison Ohio or Greensburg Indiana area, it’s never too early to start thinking about some fall trends! Even though it is tending to still be on the hot side, the fall chill will be here before you know it. With this then comes old man winter where we will be spending most of our time enjoying the comfort of our own homes, so if you feel like your house needs an update then let’s talk upcoming design trends. I’m sure that most of you have heard the term, “Curb Appeal,” but how about, “Design Curve Appeal?” Curved furniture was popular back it the Art Deco area of design, but things have their way of coming back! Now I’m not saying that you need to go find an old wingback sofa from the 1920’s but maybe something that resembles it. Curved furniture along with curved edge cabinetry is becoming a design trend that goes hand in hand. Curved arches above doorways and other taller pieces of furniture seem to help pull this design concept even closer, giving a nice flow from one room to the next. Even though it doesn’t feel like fall yet in the Harrison Ohio, Batesville Indiana, or Greensburg Indiana area, it’s never too early to start on the next design trends. Always remember to never feel nervous. Take a risk and create a style that is YOU! Here at Flooring Plus, located in Batesville Indiana, we like to give people a chance to win. Win what you might ask. A chance to win $500 in free flooring! Anyone can sign up that is the age of 18 or older! From Greensburg, Indiana to Harrison, Ohio and more, Flooring Plus is here for you! Stop in, take a look around our store, and sign up today! Choosing the perfect size rug. Choosing the perfect size area rug can be a little difficult depending on the size of the room, furniture, and more! Here at Flooring Plus in Batesville Indiana we would be glad to help you out with this as we offer in house binding! Don’t like what we have in stock? No need to worry as we can order any style of carpet on the showroom floor and bind it for you as soon as it reaches our warehouse. Now let’s talk about some helpful hints to get that perfect size you need! Typically the three main areas that rugs are needed to help ground a space and make it feel complete are living rooms, bedrooms, and dining rooms. Putting rugs in homes that have an open floor plan especially helps to define a space. When deciding on a size for the living room, there are three layouts to consider with your furniture placement. The first layout would be that all furniture legs are on the rug, second layout would be the back legs are on the floor and the front legs are on the rug, and the last arrangement would be that all legs are on the floor and not on the rug. 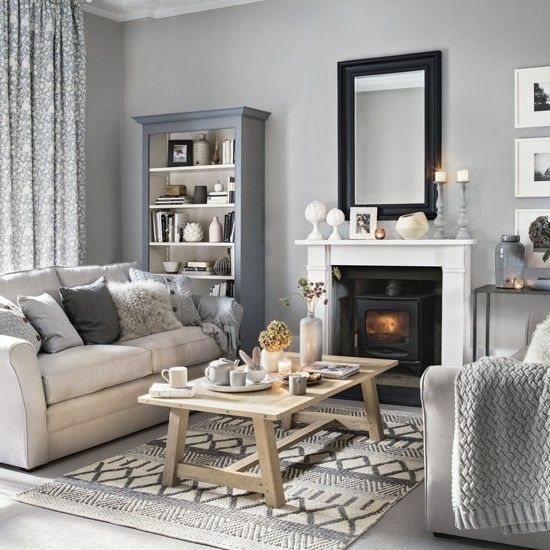 With layout for your living room it all comes down to your style and preference! Talking about the dining room there is one simple trick to getting the perfect size. Pull out all of your chairs, like you were going to take a seat, and measure the area where all legs meet the floor. That will be the perfect size for the dining room. This holds true for circular tables as well! Lastly would be the bed room. When dealing with smaller rooms you might want to consider a size that just fits under the end of the bed and not have it go all the way up to the night stand. If going with this size of a smaller rug, only have the rug extend a foot and a half off the side of the bed. If choosing a big rug for larger rooms go with a 10’ x 8’ rug or make sure that it goes under both night stands on each side. With these helpful hints, we hope that you find the perfect size rug to complete your design area. Here at Flooring Plus we would be glad to help you with this design task! Flooring Plus covers all areas from Greensburg, Indiana to Harrison, Ohio and more. From floor to ceiling we’ve got you covered! Designing a room can be fun at the start but once getting into the project you may find yourself stuck. Adding color, wonderful lighting, trending furniture, and other important details are all great ways to make change, but there is one thing you must never forget. Texture! Texture can be of all kinds. Rough, bumpy, and even smooth is a texture. These are all ways that help create and add personal touches to a space giving it a feel of comfort. When struggling on whether or not you think you have the right amount of texture ask yourself this, “If I were to walk into this room and see it for the first time, would I be drawn to use my sense of touch?” But touch is not the only sense when talking about texture. Seeing. Lets talk about seeing texture. Textures with rich, vibrant, and even complicated designs make the consumer more interested and may even give them a feeling of comfort. If I were to ask several people if nature was comforting or a place to fear I am pretty sure most would say comforting and with using rich and vibrant textures most will feel a sense of nature. Creating your personal Wall Collage on a Dime. Are you one of those people that are looking for something to change, “Just Because?” Watch HGTV to see if there is anything that is new to t ry in the design world? Well if you answered yes to these first two questions then I hoped I sparked some interest to keep reading…. Change is always good as it keeps things updated, things different, and things interesting. Change can be costly, but not always. With a little bit of helpful hints and some time you can change a space into the style of your dreams without spending high amounts of money. Design on a Dime! For example, pictures are not the only thing that can go into a picture frame. If you have kids, than I am sure they like to draw whatever creative ideas they might have. Frame this art and create a wall collage. Other things that you can put into frames may include a cool pattern found in wrapping paper, fabric, or even a shopping bag. These are easy and affordable ways to add texture and art to a space where you feel it looks dull, and if you want a little more character on your wall collage, get all different shapes and sizes of frames and other wall art. This is just one of many affordable ways that you can update your space, change the feel, and design on a dime. The amazing part about this design tip is that if you want to change the feel, than all you would have to do is just simply change out the frame and add a different texture of fabric or whatever you see fit. Always remember that with designing your own space, let your creativity have no limit! Why you should take samples home. Just a few weeks ago we had a client from the Greensburg Indiana area want to match up a hardwood sample to her existing hardwood that was installed in her dining room a few years back. After taking a few samples home with her, she found one that she truly thought was going to make her home look consistent from one room to the next, even though the sample was not the same as what was installed prior. After the installation was complete she called letting us know that she absolutely loved her new flooring and made one comment. She said, “ I am surprised of how different the floor looks from the living room to our bedroom, but I still love it.” Our response to her was, “It is amazing how natural light vs. lighted fixtures change the look in color and style.” That is why we always encourage our clients to take the samples home with them; to make sure that it looks just as good to them in the store as it does in their own home. Here at Flooring Plus, we are glad to hear of another happy client. We hope you enjoy your new flooring and home in the Greensburg Indiana area. Do you live in the surrounding areas of Batesville Indiana, Greensburg Indiana, or even Harrison Ohio, and struggle with keeping water out of your basement or home. Well we have just the flooring for you! 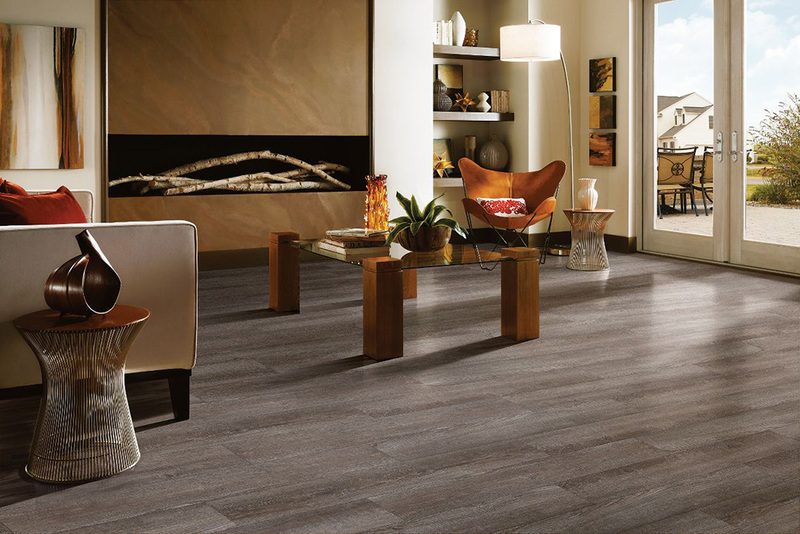 The new and improved vinyl flooring is 100% waterproof with great warranty and coverage. The new Armstrong, Rigid Core Elements, Waterproof flooring is highly durable, easy to install, and has many design options that are sure to give you that WOW factor. Styles from classic to rustic chic that are offered will help you complete that design concept of your dreams all while being one of the most affordable in the surrounding areas of Batesville Indiana, Greensburg Indiana, and Harrison Ohio. With this easy to install waterproof click and lock flooring comes an attached underlayment backing that helps reduce sound and added additional cost. Worried about the performance rating? Well rigid core has an ultra-dense core that gives it an outstanding dent resistance for any of your heavy furniture that might have been passed down for several generations. Here at Flooring Plus we are excited to bring on the newest and most affordable flooring all while serving our community of Batesville Indiana and the surrounding areas from Harrison Ohio to Greensburg Indiana, and many other counties as well. Offering free estimates and in home design consulting, we are sure you will find everything to make your house a home. Now that we are in the middle of February, most of us are probably getting used to writing down 18 instead of 17; but with that being said, do we really know what is in store for the year ahead? Whether we are talking about the latest technology, economy, or even fashion and design, we all know we are traveling through a fast changing world! If you have already done some research on the latest and upcoming design trends for the year, then some of these ideas might be a recap of another article you may have read. One of the first design areas I would like to discuss starts in an area where everyone seems to end up while hosting a gathering. If you guessed “Kitchen” then you are correct! One of the more popular design trends you might see most often in kitchen areas is a space fully dedicated for preparing or dicing food. It will often be found attached to an island in the middle of the kitchen; however, the one detail that sets it apart from the island itself is the change in countertop height. Standard counter top height is fine for cutting, rolling dough, and other food prepping tasks, but for longer, more intricate recipes that call for more time in the prepping stage, it is found to be more comfortable if the counter height is a bit shorter (3” to 4”), than the average height of 34” – 36”. If you are designing a kitchen or getting ready for a remodel, then take some time to consider adding a space for food prep. This is a great way to change up the look of your room because, like I said before, everyone likes to gather in the kitchen! So a couple of months ago, I talked about Armstrong and it’s Diamond 10 technology, how scratch resist it is and how easy it is to clean. Now Armstrong has put this technology on a solid hardwood line called Paragon. Paragon offers timeless beauty with the ultimate scratch resistant finish. According to the company, Paragon hardwood is made from 100 percent appalachian wood with patent pending Diamond 10 Technology, a flooring innovation exclusive to Armstrong Flooring, which incorporates cultured diamonds to create a powerful wear layer of scratch protection without clouding the beauty of the hardwood underneath. Diamond 10 provides resistance to stains and dirt, and is durable to traffic and cleaning. It is also manufactured in USA. There are 3 styles, the smooth look, the scraped or textured and brushed, in high gloss or low gloss finishes.